Offer nice views to your clients while you protect them from wind, sand, thefts, etc. With Todocristal glass windbreaker you can adapt the windbreaker height for a major comfort of your clients since the top glass panel moves vertically. 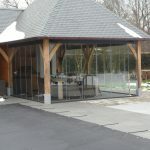 Glass windbreaker provides a cosy area for your clients, without isolating them from what's happening outside. They are made in aluminum by Todocristal and the standard design includes laminated safety glass. Your clients will be sheltered from the wind and will enjoy a cosier space. The top glass panel can move vertically in five different standard positions. You can add your logo. As well as protecting your terrace you will display your brand image. 6 mm laminated glass in the windbreaker moving part, with 2200 mm maximum width per section. The corner connectors and supports are made of salt corrosion resistant steel. Choose the finishing of the bottom fixed part: any RAL lacquered color, aluminum or wood design. 2200 mm maximum width per section. The bottom fixed part is available in different options: translucent, colored or with your logo. It can also be provided in other finishing as aluminum, wood design or any RAL lacquered color. Standard colors are: silver anodized and lacquered black. Different kinds of supports to install the windbreaker. Different corner connectors and wall fixations. All the corner connectors and supports are made of steel treated against salt corrosion. Optional blocks in different heights. Lock with key at the lowest and highest position. 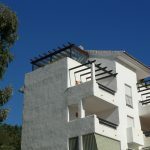 The installation of the glass windbreaker will protect your terrace from the wind, sand and dirt. The windbreakers provide a cosier space for your clients without giving up to the views. You can add your business logo in the windbreaker bottom glass. This way you will project your company image while you offer protection to your clients. The top glass panel is adjustable to adapt to your clients needs. You can also lock the system. Customize your system colors and finishing to match your terrace decoration.